“These Bangladesh nationals are residents of Netrakona and Sunamganj of Bangladesh,” the BSF said. BSF troops guarding the border. Representative picture only. 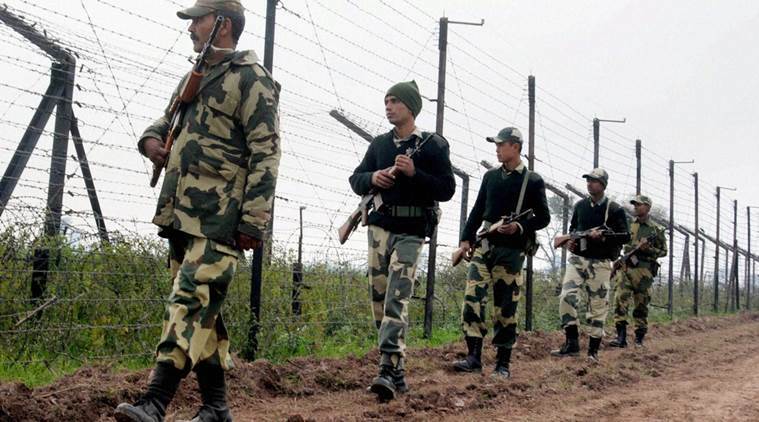 Troops of Border Security Force (BSF) deployed along Meghalaya Frontier have arrested 11 Bangladeshi nationals including four minors, in South Garo Hills district. According to a statement issued by the BSF on Thursday evening, an Indian national, Manmohan Majumdar (48 years) of West Bengal’s Cooch Behar district, suspected to be a tout, was also arrested. The Bangladeshi nationals were arrested on Wednesday during checking of vehicles on National Highway-62 between Baghmara, the district headquarters of South Garo Hills and Tura, the district headquarters of West Garo Hills. Baghmara is close to the international border. The apprehended foreign nationals were identified as Nirmal Sarkar (34), Pronoy Dey(23 ) Sapan Barman (33), Kabi Ranjan Dey (25), Nupur Talukdar (22 ), Suma Sarkar (25), and Kana Rai (20). The other four minors are aged between two and five years. “At present, just before the general elections in Bangladesh, a tense situation is prevailing in Bangladesh and under these circumstances, minority community are seemingly feeling insecure in Bangladesh. In this case, these Hindu Bangladeshis were trying to infiltrate into Indian territory through an unfenced jungle area for further safe passage. During the questioning of the tout (Manmohan Majumdar), it was revealed that he had sneaked into Bangladesh one week ago, and contacted all the Bangladeshi nationals with the help of one Bangladeshi national namely, Sukumar Dayal Hajong of Nayankandi under Kalmakanda district,” the statement said. The BSF said that the apprehended Hindu Bangladeshis confessed that they have relatives in India residing in Cooch Behar, West Bengal. Majumdar confessed that he was residing in Kalmakanda, Nayabazar in Bangladesh for about 17 years.